Do you need a sweep? 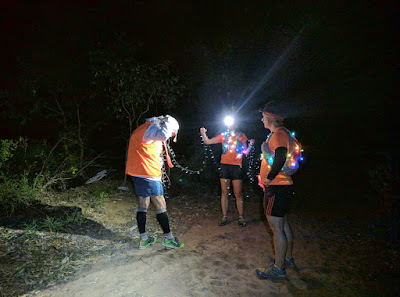 After running a race nearly every two weeks for the previous three months, I decided I would like to give something back to the trail running community. I volunteered to ‘sweep’ the course the first night trail run of the Perth Trail Series 2017 series. The job entailed running the course, slowly, picking up all the course markers and a couple of marshals along with way. We were also there to catch the back of the pack: provide encouragement where needed or just sit back and let the runners push on if they were happy. I was sweeping with a couple who I had met briefly a few years before so we chatted the night away, picking up reflective tape and fairy lights as we went. Down the far side of the lake the chitchat slowed a little and we could hear the frogs singing in the wetlands. The field was pretty fast and we only caught up to them towards the end. No encouragement needed so we just sat back and carried on picking up the glittering course markers. At the end, most of the runners had dispersed as prize giving had been and gone. We joined in with the other volunteers to help break down the finish area before heading off home, warm with a glow in knowing that we helped others have a bit of fun.